BlackPeopleMeet.com was founded in 2002 and is the largest dating site of its kind in the United States and Canada. In one month, four percent of the total black population in the US will have visited the service. This site is for black men, black women and others who are interested in meeting someone special for friendship, a relationship or just to have fun. Having a large community of African American singles at your fingertips makes it easy and fun to connect with other singles in your area. BlackPeopleMeet's mission statement is “Creating Relationships. Connecting Lives.”--so why not give them a try today if you are looking to meet someone new? It is free to post a profile, search for black singles and to send flirts. 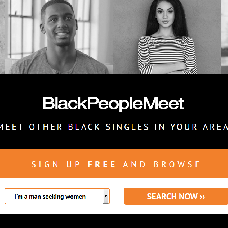 While ultimately BlackPeopleMeet was designed for black people looking for other black people, other races can be found on the dating service. BlackPeopleMeet does not discriminate and allows people of all races to join who are interested in meeting a single African American for a relationship. BlackPeopleMeet is a dating site for people, to find people like themselves.